For several years we have sponsored and supported Cash for Kids and Mission Christmas however this year we’re immensely proud to announce we are the official Mission Christmas digital partner for 2017. This is a fantastic opportunity for us here at MID Communications to really get involved in what is a great cause helping those who are less fortunate. For years now Key 103, Rock FM and Radio City have been running the appeal and have helped an incredible number of disadvantaged children and families from across the North West, allowing them to wake up to something special on Christmas Day when they’d otherwise get nothing. Therefore, having the opportunity to sponsor and be the Mission Christmas digital partner for this wonderful initiative for 2017 really warms our hearts and we hope we can contribute to creating a positive festive season for as many children as possible. As with previous years, all of our stores are registered Mission Christmas drop off points so feel free to pop into any of our Mid Communications O2 stores to hand in any of your gift donations, details of where to find our stores can be found here. Additionally, as we are the official Mission Christmas digital partner for the appeal this year we will be getting even more hands on in lending our digital knowledge and support to the initiative. 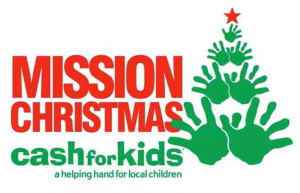 Throughout the Christmas period we will be interacting with the Cash for Kids accounts across our social media platforms to spread awareness of what the team here at MID Communications are doing to support Mission Christmas and all the wonderful things the people of Greater Manchester are doing to help those less fortunate. Moreover, we will be supplying the appeal with equipment throughout the campaign to ensure the best experience possible for all. As we are the Mission Christmas digital partner we will be featuring heavily across the their website, the Cash for Kids social media pages and official videos throughout the campaign. Not only is this an amazing opportunity to aid an extremely useful and touching cause but it is also an opportunity to grow MID Communications as a brand by showing people our values and what we’re all about. We were privileged enough to be invited down to the official Key 103 Mission Christmas launch event on the 14th November, a great night where everyone had to have tissues at the ready. It was a thoughtful event which brought together all of the organisers, sponsors and partners to formally kick off this year’s appeal with our very own CEO Danny Simpson and Marketing & Events Manager Jay Seville getting involved to promote the initiative and highlight what we’ll be doing as Mission Christmas digital partner. In the end the main message behind the challenge is that too many children wake up on Christmas morning without anything to open therefore we’re hoping we can contribute as best we can to a big effort this year for Mission Christmas. To finish, we are tremendously happy that this digital partnership with Mission Christmas 2017 materialised and we can play a huge role in this rewarding appeal. From everyone at Mid Comms we hope we can see a record number of donations and children helped this year to provide a memorable Christmas for as many families as possible. So get involved, get donating at our participating stores and have a very Merry Christmas!